Earlier on today it was announced that there will be a Live-Action film adaptation of Ookami Shoujo to Kuro Ouji, also known as Wolf Girl and Black Prince. The film will be released in May 2016 in Japan. Releases in the USA and UK are unknown. 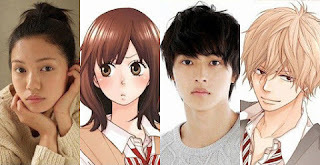 Protagonist Shinohara Erika will be played by 20-year old Fumi Nikaidou, and Sata Kyouya will be played by 21-year old Kento Yamazaki, who plays L in the Death Note Live-Action Drama series. For now there is just a 10 second teaser showing the two characters and their actors. The film will be directed by 61-year old Ryuichi Hiroki who has also worked on two other live-action film adaptations for manga Otoko no Isshou and Strobe Edge. For those of you who don't know the story, Shinohara Erika is a 16-year old high school student who bragged to her new friends that she has a boyfriend and they are very much in love. Wanting proof, her friends ask her to take a picture of him, which throws Erika off. She then goes around looking for a random boy, finds one and takes a picture of him. But when she shows the picture to her friends, it turns out that the boy is Sato Kyouya who attends the same school as them and is the most popular boy at the school. Erika then finds the boy and tells him the reason why she took the picture, and asks him if he can pretend to be her boyfriend. Kyouya agrees, but in return, she must be as loyal to him as a dog. That's all the news of the film adaptation for now, but if you haven't seen the anime yet, I highly recommend it. It's full of comedy and drama as Erika and Kyouya try to act like a lovey dovey couple around their friends and fellow students, while Kyouya treats Erika like the dog he told her to be. Hopefully the live-action film adaptation will be as good as the anime if not better, and stay tuned for more info guys!